Honey bees are under constant pressure from a whole host of stresses—diseases, poor nutrition, sublethal effects of pesticides, and many others. 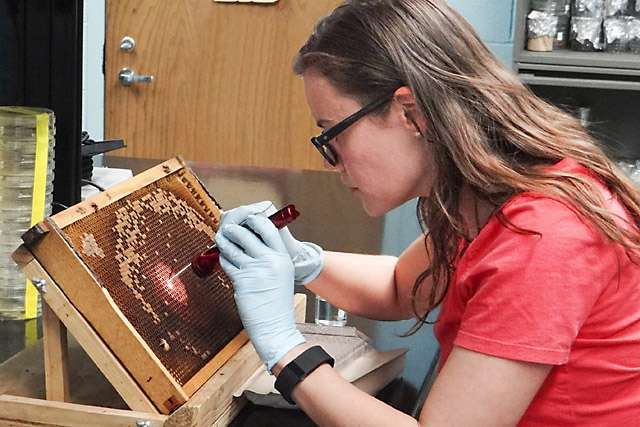 While researchers have been aware for a number of years of a community of bacteria in adult bees that may aid with some of these stresses, Agricultural Research Service researchers have identified the first bacteria that offer a benefit to bee larvae. Molecular biologist Vanessa Corby-Harris and microbial ecologist Kirk E. Anderson at the ARS Carl Hayden Bee Research Center in Tucson, Arizona, have named a new species of bacteria—Parasaccharibacter apium. An Acetobacteraceae so far found only in honey bees and their hives, it appears to give honey bee larvae a significantly better chance of surviving to become pupae. 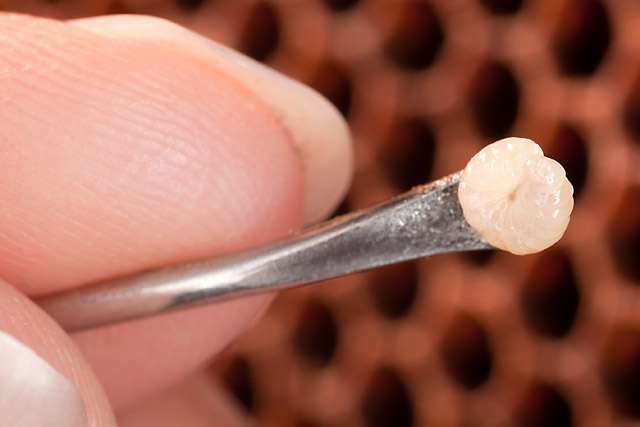 Honey bees have four major life stages: egg, larva, pupa, and adult. Work on P. apium was initiated by an earlier post-doctoral researcher, Lana Vojvodic, who first discovered that these bacteria were abundant in larvae and also thrived in royal jelly. Royal jelly is a protein-rich substance produced by adult bees in their hypopharyngeal glands, which resemble bunches of grapes on each side of the head. Nurse bees secrete and feed the jelly, which may contain P. apium, to young bee larvae. This jelly is the only food bee larvae eat during their first couple days. Then they are fed increasingly more honey, which has also been found to contain P. apium in most bee hives. In laboratory experiments designed by Corby-Harris, bee larvae were fed either P. apium-spiked jelly or sterile control jelly. The group fed P. apium had a 20-percent better survival rate in the first trial and a 40-percent better survival rate in the second trial. "We haven't yet identified what P. apium does that confers this survival advantage to the larvae. It could involve the production of organic acids and lowering pH, which might have an antiseptic effect, or its presence might induce an immune response that could later work against larval pathogens," Corby-Harris says. While P. apium found in honey bee hives is a distinct and new species from any previously identified, it has very close, naturally occurring relatives found in the nectar of many flowers, including cactus flowers, daisies, thistles, and apple blossoms. Acetobacteraceae bacteria from flowers have not been tested yet to see if any of them might provide bee larvae with the same survival benefit, nor has there been a wider survey to determine the occurrence of P. apium-like species in economically important crops visited by bees. "We have sequenced the genome of P. apium and begun to dissect the functional properties that distinguish flower-living Acetobacteraceaefrom those that have coevolved with the honey bee hive. Pinpointing these ecological differences will be key to understanding the function of P. apium in honey bee hives," says Anderson. With minimal sampling effort, P. apium was found in nearly every one of the healthy managed bee colonies examined by the researchers. A future study will explore the abundance of P. apium in weak or struggling managed bee colonies. While the mechanism by which the bacteria benefit the larvae remains to be studied, the importance is clear enough that Corby-Harris and Anderson are already field testing its use as a management tool. "Along with P. apium, we are testing a number of bacteria that may benefit the pollination and honey-production industry," says Corby-Harris. "More broadly, our research suggests that a community of bacteria that includes P. apium confers a generalized hygienic quality to the hive environment," says Anderson. "So we advise against unnecessary use of antibiotics by beekeepers, as it likely disrupts the variety and balance of microbial functions occurring throughout the hive, including the antiseptic properties of honey, pollen storage, larval health, and pathogen protection."